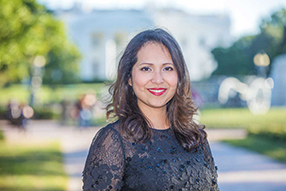 Diana Merino serves as Science Policy Analyst at Friends of Cancer Research (Friends). Friends is an advocacy organization based in Washington, DC that drives collaboration among partners from every healthcare sector to power advances in science, policy, and regulation that speed life-saving treatments to patients. During the past 20 years, Friends has been instrumental in the creation and implementation of policies ensuring patients receive the best treatments in the fastest and safest way possible. Diana is passionate about disseminating scientific research findings and implementing solutions to accelerate progress in cancer care. Her own experience with the disease drives her desire to improve awareness of the needs cancer patients and survivors face, and the importance of cancer research. She has accumulated a wealth of experience as a spokesperson, cancer advocate, committee member, and 2016-2017 Chair of the American Association for Cancer Research (AACR) Associate Member Council, whose goal is to promote the professional development of early career scientists. At Friends, Diana will work on the development of evidence-based policies that will improve care for cancer patients and survivors, facilitate dialogue between stakeholders through the organization of conferences and symposia, and continue advocating on behalf of cancer patients and survivors. Diana received her PhD in cancer genetics from the University of Toronto and a MSc in human health and nutritional sciences from the University of Guelph in Ontario. She pursued her postdoctoral research work at the National Cancer Institute (NCI) Division of Cancer Epidemiology and Genetics, Radiation Epidemiology Branch. Her work focused on identifying the genetic determinants of second cancers in cancer survivors, and elucidating risk for second sarcoma in survivors of pediatric and young adult cancers.